We are located in Northern California U.S.A.
We occasionally Buy Eggs.. if you have excess eggs, contact us for pricing. PLEASE READ: I know it’s long, but it is important Be sure to include your mailing address with your order (even if you are a regular customer) It helps to speed things up. A little about us: All eggs are from Domestically Raised Birds Bracken Ridge Ranch / The Eggers Nest has been specializing in Professional Quality blown eggs for Egg Artists, Crafters, Collectors, Schools, Natural History Museums etc. since 1997. We do not use any chemicals in our cleaning process so all of our eggs take Pysanky and other types of dyes very well. When possible our eggs are cleaned through 1 hole drilled dead center in the large end of the egg with the smallest drill bit possible. However, it is sometimes necessary on the smaller eggs to use 2 holes. When that becomes necessary (to keep the egg from imploding during cleaning) the second hole is the size of a needle point. Now, For the ordering part: We deliberately do not have an on-line order form. That is because our inventory changes daily. Here’s what you do: Once you have decided on which eggs you are interested in please send us an email telling us which eggs you would like, and the quantity of each kind. We will check our inventory and email an invoice through Paypal to you with the total amount of your order including S&H (if you have given us your mailing address) You do not have to have a Paypal account to use them as a secure method of credit card payment, you can check out as a “guest” following their simple instructions. We also accept domestic money orders and checks. All orders are shipped via Priority Mail unless other arrangements are made. S&H is calculated by the size of the box and the total weight of the eggs and box. (our handling fee is only $3.50 above that to help cover the cost of the box, packing materials, labels, trips to the P.O etc.) We try to keep shipping as low as possible. If we are out of a particular item, we will contact you via e-mail and let you know, otherwise sit tight and you will receive an invoice as soon as possible. Everything you need to know except availability is all here! Colors are: Midnight Black (super dark black) and Natural (warm honey golden) Sold in individual units of 1 ounce each Individually packaged to keep dust and debris out. Ask us to add a few to your order, you won’t be disappointed! We are getting rave reviews! 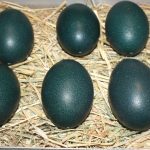 Originally Native of South America, hybridized in U.S. Eggs have bluish-green to greenish-brown tint. Approx. 2 1/2 to 2 3/4 inches long. These are small! Native of U.S. Eggs are white with unique teardrop shape. Approx. 1 1/4 inches long but may vary slightly. (Correct name is: Chinese Blue Breasted Quail) Native of S.E. China. Smallest Quail in World Eggs are brown with small specks but may range into beige and greenish hues. Approx. 1 1/2 to 1 3/4 inches long. Bantam/Banty Chickens come in a wide variety. These eggs are from various Bantam Chickens we have on the ranch they are approx. 1 1/4 to 1 3/4 inches long. They will vary in shape and size. Photo is just an example. From various Bantam/Banty Chickens we have here on the ranch that lay white eggs. May have tan tint Approx. 1 1/2 to 2 inches long. Standard chicken egg from various domestic chickens that lay a brown egg. Color varies from light to medium brown. Approx 2 to 2 3/4 inches long, but may vary. Standard Chicken egg from various domestic chickens that lay a tan/beige tinted egg. Eggs are approx. 2 to 2 3/4 inches long but may vary. Standard chicken egg from various domestic chickens that lay a white egg. Eggs are approx. 2 to 2/3 inches long but will vary. Approx 2 to 2 3/4 inches long will vary in size and depth of color some have spots. Note: these have a soft finish so they might have scratches from hay and hens. Chukar are native to Asia &amp; Europe. 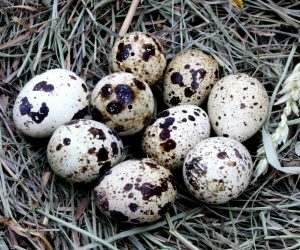 Eggs are tan, and most have small speckles, however some do not have the speckles. They are approx. 1 1/2 to 2 inches long. Cockatiels are native of Australia. Eggs are white. They are approx. 1 inch long. Size and shape will vary slightly, the photo is an example only. Coturnix are native to Egypt Asia &amp; Europe. Eggs are tan with varying specks and blotches. They are approx. 1 1/4 inch long. Size and shape will vary slightly, the photo is an example only. Diamond Doves are the smallest doves in the world. They are native to Australia. Eggs are off white with a very slight yellowish tint. They are approx. 3/4 inch long. They will vary in size and shape, the photo is an example only. From an assortment of various domestic ducks on our ranch. Bantam duck eggs are smaller than standard duck eggs and are white OR bluish tint. They are approx. 2 1/2 inches long. Size, shape and color will vary, the photo is an example only. From assorted ducks that lay a white egg (mostly Peking and Muscovy) They are approx. 2 3/4 to 3 inches long. From an assortment of various ducks on our ranch that lay blue eggs. The eggs have a light bluish tint and are approx. 2 1/2 to 3 inches long. Size and shape will vary as will the intensity of color. The photo is an example only. Emu are native to Australia. Their egg average roughly 5 inches long, they vary in color from green to blue and even to a deep blue that is almost black. Game Hens are the smallest of the Bantam Chickens The eggs are light brown for the most part, but some are white. They are approx. 1 1/4 to 1 1/2 inches long. Size and shape will vary, the photo is an example only. From Assorted domestic geese on our ranch, mostly Toulouse, and China Geese. Eggs are white and approx. 3 to 3 1/2 inches long. 9 to 9 /12 measured around long side. Size and shape will vary, the photo is an example only. Guinea fowl are native of Africa. Eggs are tan with faint spots, although some don’t have spots. Some have faint blotches rather than spots. Patterns are inconsistent. They are approx. 1 3/4 to 2 inches long. They will vary in size and color, the photo is an example only. Native to Europe, Africa and Asia. approx. 5 inches long (Domestically raised). They look like miniature Robins Eggs, but will vary in color and spots. They have a very soft and delicate shell, so not recommended for Egg Art. but look cute in a nest or display. They are approx. 3/4 inch long. Ostrich are native of Africa. Eggs are off white. they are approximately 15 to 17 inches when measured all the way around the long way. They will vary . The photo is an example only. Clean out hole in large end is approx 1″. Parakeet are native of Australia. Eggs are white and have an assortment of shapes from elongated to round. They are approx. 3/4 inches long. They will vary somewhat, the photo is an example only. Peafowl are native of Asia. Eggs are tinted brown, some may have light spots others are plain. They are approx. 2 3/4 inches long. Size and shape may vary, the photo is an example only. Pheasants are native of Asia. 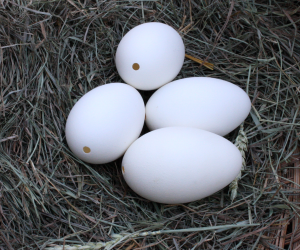 Eggs vary in color from Khaki brown to darker brown.They are approx. 2 inches long. Size, shape and color will vary, the photo is an example only. Pigeons are common worldwide, the eggs we offer are from domestic pigeons raised here on the ranch. They are white and approx. 1 1/2 to 1 3/4 inches long. They will vary in size and shape depending on the species of Pigeon they are from. The photo is an example only. Rhea are native of South America. Their eggs are off white, but some also have a yellowish tint to them. They are approx. 11 – 14 inches measured all the way around the long way (lengthwise) They are approx. 5 inches tall. They will vary in color, size and shape the photo is an example only. Native of the U.S. and Europe. Eggs are white and approx. 1 inch long. They will vary in size and shape slightly. The eggs in the photo are examples only. There are several species of Tinamou throughout Central and South America, These, as the name implies are from Chile .They are Approx 2 inches long, side blown for display. They have a natural glossy sheen that makes them look like glass. From Domestically raised stock. Eggs are collected from various turkeys here on the ranch. Eggs are tan with varying degrees of spots. Some are void of spots and have an off white color. They are approx. 2 1/2 to 3 inches long. NOT DOUBLE YOLK Size and color will vary depending on the species. Zebra Finch are native to Australia. Their eggs are the smallest of all craft eggs available. They are white with a bluish tint. They are approx 1/2 inch long. They are fairly fragile to work with. The shape and color will vary. The photo is an example only. We sometimes have “boo boo” eggs available. These are eggs that have natural occurring blemishes such as “Pimples” (calcium deposits) slightly misshapen or have other anomalies. Sometimes we accidentally drill a hole in both ends or the drill slips when we are drilling and the holes are large or out of shape. Ostrich: $12.75 ea, Rhea $12.75 ea, Emu $10.50 ea, Goose $1.95, Duck $1.50, Chicken $1.35 E-mail to ask availability on these and any other boo boo eggs you might be interested in. We also have “Bits & Pieces” (broken shells) for Jewelry and Mosaic work $9.50 a pound Available in mixed bags only.. each bag will contain Ostrich, Emu, and Rhea. © Copyright 2018 Bracken Ridge Ranch, All rights reserved.